Oregon sunstone is mined in two broad areas of the state more than 100 miles apart: the Ponderosa mine in Harney County, in central-eastern Oregon, and the Plush mining area in Lake County, southwest of the Ponderosa. The Ponderosa deposit was discovered in the summer of 1980 when a logging operation cut roads through the area and cowboys running range cattle discovered clear crystals on the surface. Gem broker Larry Gray first worked the claim, the third known deposit of Sunstone in Oregon. As mining activities continued it became obvious that the Ponderosa produced the widest range of colors in labradorite feldspar ever discovered. Oregon sunstone comes in all shades of the rainbow, although colors of red, salmon, and green are the most sought after and command the highest prices. At its best, the red facet grade material from the Ponderosa Mine is as fine a color as the finest ruby or red spinel from Burma, the blue greens are like emeralds, the gray greens like green diamonds, and the peaches and orange roses can double for imperial topaz. In 1985, miners unearthed an enormous piece of rough weighing approximately 40 carats. 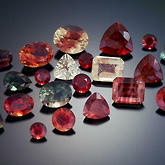 It was then faceted into three separate stones, one of which was a deep red sunstone weighing 10.7 carats. It was named the Ponderosa Queen and caused such a sensation that the Oregon legislature adopted the rare labradorite as the official state gemstone. In September of 2003 Desert Sun Mining & Gems purchased the Ponderosa Mine. Soon after, owner John Woodmark found a gigantic stone that weighed approximately 310 carats. The rough stone was carved into two individual works of art, each of which contains all of the colors in the sunstone spectrum.